Happy Wednesday everyone! I have had a tiring but great day today and I hope you can say the same. 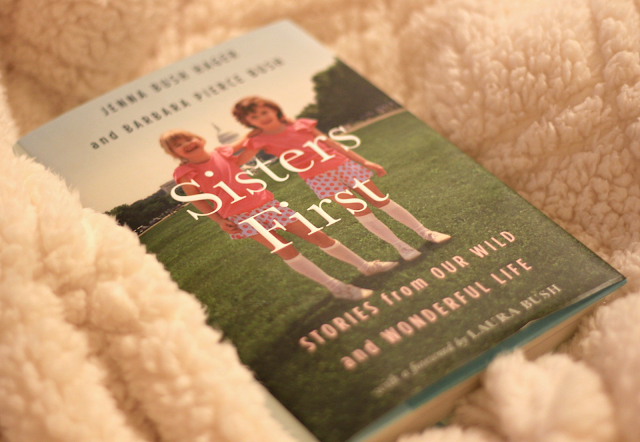 I was SO honored when Grand Central Publishing reached out to me and offered to send me a copy of Jenna Bush Hager and Barbara Peirce Bush's new book 'Sisters First' which is described as "Stories from our wild and wonderful life". Y'all already know how much I loved reading Laura Bush's book this past December so I was thrilled to read her daughters as well. After reporting back my thoughts to the sweet folks at Grand Central Publishing, they decided to offer TWO of you a free copy as well... I mean how stinkin' sweet are they? I will start by saying that my opinion is partially biased because I am already a big Bush family fan. I didn't know squat about them before reading Laura Bush's memoire but after reading that, and doing research on them, I am pretty sold. Therefore, I went into this with a hopeful attitude that I would learn even more insight into their life! I will say that this collection of short stories were written SO personally. There was honestly no holding back but both girls wrote with such grace and elegance also. Their style of writing and language usage was so easy to read and made it a breeze to go through. The Bush twins cover simple stories of their childhoods up to the heartbreaking reality of 9/11 and the war that followed. I so appreciated their transparency. The only negative thing I have to say about this book, is that I am not a fan of books that don't go in chronologically order. They jump from one time in their life to another and they don't go in order. This wasn't a huge deal to me because I kind of got the full timeline from reading Laura Bush's book, however, if you haven't read that one, you might find it difficult to follow this book. I am so excited that Grand Central Publishing wants to send two of you a copy of this book also. You do have to live in the US or Canada. The giveaway will start on November 2nd at midnight and end November 12th at midnight. ENTER BELOW! Well there you have it y'all! I hope you enjoyed this post and have time to enter the giveaway! I will talk to you on Friday! Aw yay Laura! Good luck!